New York & Company, Inc. (NYSE:NWY) stock gained over 17% today on a surging volume of 0.7 million shares trading hands compared to its daily average of 0.06 million shares. 11 times average daily volume was traded and the share price adds gains to its rally since mid-February. NWY ended the day at $3.11 which is down from its intra-day high of $3.44 which is also its new 52-week high. New York & Company, Inc. (NYSE:NWY) shares have advanced over 40% since mid-February and more gains will likely be in store if the share price can trade above its current trading range and break above its resistance levels. NWY posted its earnings results for fourth quarter and fully year 2015. It announced its operating income improvement is at its best level since 2008 when the stock traded at $11 over three times higher than it is trading today. Technically speaking, the stock has made a powerful advance, but it remains to be seen if it can sustain this move or if it’s headed back down to the $2.00 range. The stock closed almost at exactly the same price as its prior rally and wouldn’t be surprised if the stock traded sideways till the next earnings release or slightly lower. If NWY can exceed expectations of their guidance and enter growth mode, then investors would have reason to push this to the next level and could even potentially reach its heights in 2008 to $11. NWY’s revenues increased 3.1% for the full year to $950 million in 2015 from $923 million in the prior year. It posted an operating loss of $8.1 million for 2015 compared to an operating loss of $15.6 million. For fiscal year 2016, the Company expects to open approximately 2 New York & Company stores, open 1 new Outlet store, remodel 5 New York & Company locations, convert 50 New York & Company locations to new Outlet stores, and close between 8 and 12 New York & Company stores, ending the fiscal year with between 481 and 485 stores, including 133 Outlet stores. NWY is a specialty retailer of women’s fashion apparel and accessories, and the wear-to-work destination for women. Its branded New York & Company merchandise is sold through its national network of retail stores and online at www.nyandcompany.com. The focus customers for the merchandise are women between the ages of 25 and 45. NWY operates approximately 504 stores in 43 states, with an average of approximately 5,153 selling square feet per store. It offers a merchandise assortment consisting of wear-to-work, casual apparel and accessories, including pants, dresses, jackets, knit tops, blouses, sweaters, denim, t-shirts, activewear, handbags and jewelry. It operates approximately 62 outlet stores. 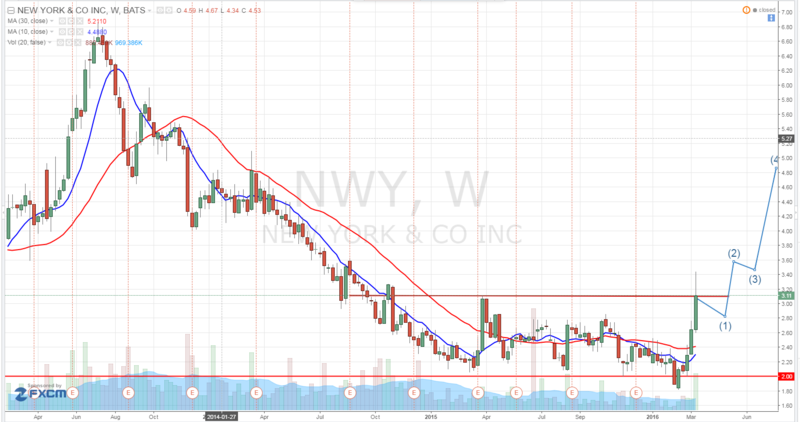 NWY is currently trading at a $200 million market valuation. It is trading at a price to sales ratio of 0.19 which is very low when compared to the industry average. If it were to trade at a price to sales ratio of 1, the market valuation would be $950 million which would be a gain of 375% from current levels. The stock price would be in the $14 area. We will be updating on NWY when more details emerge so make sure you are subscribed to Microcapspot so you know what’s going on with NWY. Disclosure: we hold no position in NWY either long or short at the publication of this article and we have not been compensated for this article.